The Pence Ranch Estate Vineyard, part of a 200-acre working ranch and polyculture, is planted to Pinot Noir, Chardonnay and Grenache, just east of the Sta. Rita Hills AVA. The vineyard is situated on an elevated plateau that is fully exposed to the maritime winds and morning fog. It is the first vineyard in the region to incorporate advanced computer modeling in its design taking into account multiple soil types, sun exposures, drainage patterns and other elements. The result is 19 different blocks (10 currently producing) totaling 50.4 acres planted beginning in 2006. Comprising 12 different clones and 5 rootstocks, the vineyard includes both modern clones (Dijon 667, 115, 828, 459, and 777, and Pommard and 2A for Pinot Noir and Dijon 76 and Mt. Eden for Chardonnay) and heirloom selections (Swan, Mt. Eden), planted at a density of 1,815 vines per acre (8’ x 3’). The vines are spur pruned with unilateral cordon and vertical shoot positioning. Sustainable farming practices are employed throughout. The proprietors are Blair Pence and Holly Brooks. Pence has a long obsession with Pinot Noir and has traveled frequently to Burgundy to observe how grapes are farmed and vinified. He says, “I would be lying if I said my team and I do not have the highest aspirations for our vineyard and our wine program. When you pursue Pinot Noir seriously, you have to go big, or go home. We have spared no expense in developing our site. It is a purposeful vineyard, in that everything was done very deliberately to achieve the highest level of quality in our wines. Our philosophy is a non interventionist, site-driven one.” Vineyard management is under the direction of Francisco Ramirez, Stan Kadota and Daniel Garibay. The winemaker is veteran Jeff Fink, formerly a winemaker at Tantara. The Pence Ranch Estate is located just outside the Sta. Rita Hills AVA, so Pence has recently filed a petition with the TTB to extend the eastern boundary of the Sta. Rita Hills AVA to include Pence Ranch Vineyard as well as John Sebastiano Vineyard and Rio Vista Vineyard. The board of the Sta. 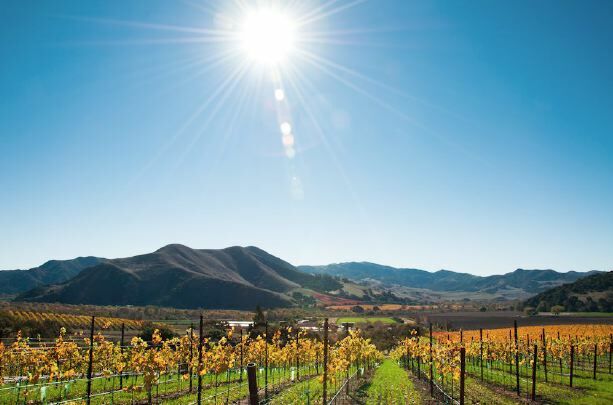 Rita Hills Winegrower Alliance has opposed the expansion because the area has a north-south orientation in contrast to the current east-west orientation of the AVA and lacks the same maritime influence of the current AVA. Pence may need to initiate a proposal for a new AVA. Grapes have been sold in previous years to a number of Santa Barbara County wineries. 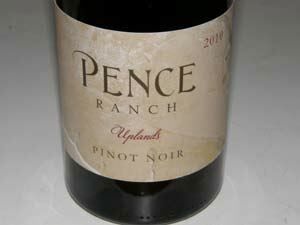 The inaugural 2010 Pence Ranch Estate wines were sourced from five producing blocks. Average yields were 1.35 tons per acre. Harvest was between September 20 and October 12 (both before and after an intervening heat spike). Winemaking for the inaugural 2010 vintage was as follows. After night picking, the grapes were rigorously sorted in the vineyard and at the winery. Both native and inoculated fermentations were carried out in small open-top fermenters. Some whole cluster was used depending on ripeness of stems and the general health of the fruit. Free run juice was barreled directly from the fermenter. The press wine fractions were combined and barreled separately. The wines were aged in 1-year and older French oak barrels. Malolactic fermentation was indigenous. The wines were sometimes racked in summer after the completion of malolactic fermentation, with no further racking before bottling which occurred after 19 to 22 months in barrel. Three of the four wines from the 2010 vintage are reviewed here. Not tasted was one barrel of Swan selection Pinot Noir that was so singular it had to be bottled on its own. This wine was aged in a 2007 Francois Frères barrel for 19 months (23 cases, $80). The three wines I tasted were impressive for their aromatics, fruit attack, and finishing intensity. The word promiscuous seems appropriate. 14.5%, 620 cases, $30. From all five producing blocks. 15% whole cluster. Aged 22 months in 1-year and older French oak barrels. Unfined and unfiltered. · Moderately dark reddish-purple color in the glass. Generous nose with aromas of black plum, blackberry jam, fruit leather and a touch of dark strawberry glaze. Middleweight core of dark red and black berries, plum and Hoison sauce with a touch of earth and spice. Noticeable oak in the background which recedes over time in the glass. Well-managed tannins with good acidity. About the same the following day from a previously opened and recorked bottle. Good. 14.5% alc., 295 cases, $40. From two producing East Blocks. Pommard and 115. 15% whole cluster. Aged 22 months in 1-year and older French oak barrels. Unfined and unfiltered. · Moderately dark reddish-purple color in the glass. Very giving nose offering aromas of red and black berries, exotic spices and a hint of peppery herbs. Very satisfying flavors of dark berries with hints of spice, vanilla and smoky oak. Nicely balanced and easy to cozy up to, leaving behind a pleasant impression. Still pumping out the aromas and flavors the following day from a previously opened and re-corked bottle. Plenty of Pinot singing here. 14.5% alc., 94 cases, $50. From three producing West Blocks. 667, Swan and 828. These blocks are exposed to significant wind and have heavier soils than the East Blocks. 15% whole cluster. Aged 22 months in 1-year and older French oak barrels. Unfined and unfiltered. · Medium reddish-purple color in the glass. Very pretty aromatics with plenty of pure dark red cherry and just the right touch of oak. Soft and inviting on the palate with a discreetly concentrated core of dark red cherries and berries, finishing with a surge of cherry fruit with just a hint of oak. About the same the following day from a previously opened and re-corked bottle. Very good.